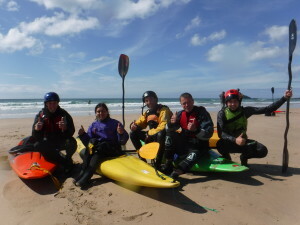 Building on the success of previous events, Surf Kayak Coaching are pleased to announce more dates for next year. There will be two Cornwall symposiums, again based in the stunning St Ives Bay, Cornwall. The Brittany Trip in September was a huge success and the plan is to develop this event further, again joining with sea kayakers and Rick Cooper (British Sea Kayaks). See below for the plan for this year. Our symposiums have a real focus on providing quality coaching sessions in the right conditions for learning. 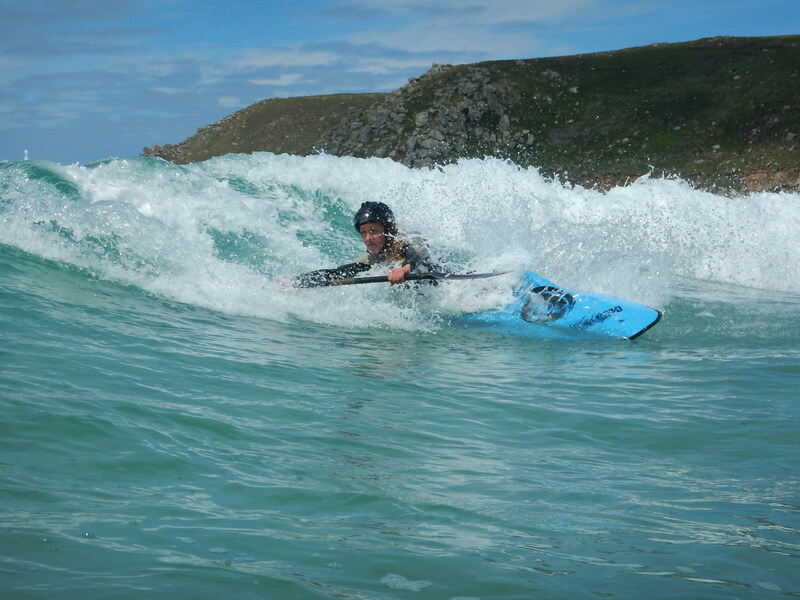 St Ives Bay is well known to surf kayakers from around the country providing a perfect learning environment from small waves over gentle sand bars at the west to larger waves onto a perfect beach break in the East (and everything in-between). With one coach to every six participants and a maximum of 30 participants, you’ll have a personal experience. Our aim is for you to thoroughly enjoy the weekend and to come away with a new or much improved set of skills and a huge smile on your face. Download the FAQs for more detail about what is involved and what you need. The cost is £110 per person for the coaching with accommodation fees paid direct to Beachside Holiday Park. 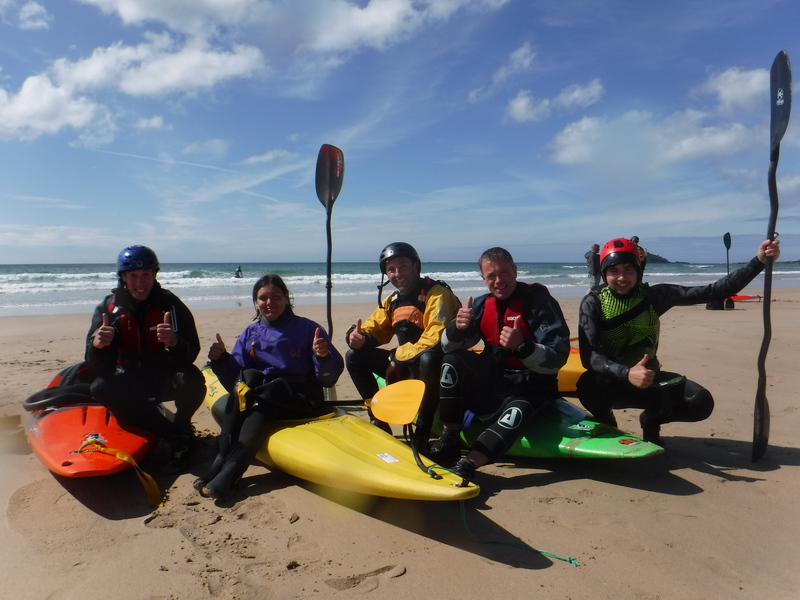 Surf Kayak Symposium (South West) Spring 27-28th April and Autumn 12-13th Oct.
Brittany Trip dates 22nd – 27th Sept.
ONLINE BOOKING : Available for April 2019. Select the button below; this takes you to the booking system on our Lizard Adventure site. Please call or email if you have any questions about the booking process. Rick Cooper (British Sea Kayaks) and John-Paul Eatock (Surf Kayak Coaching and Lizard Adventure) have joined forces to combine their expertise in both Surf and Sea Kayaking to deliver a trip to Brittany to challenge and suit your paddling needs. Experts in their field, they are excited to share with you the best the Brittany coast has to offer, using their high level coaching and guiding experience plus an intimate knowledge of the area. What level paddler do I need to be? For Surf kayaking, we are happy to work with novice through to advanced. 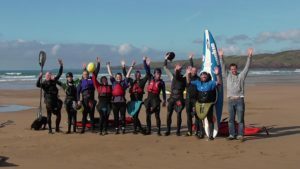 Once the surf kayakers have shared their level of experience and aspirations with us, we endeavour to pick the best spot to suit your ability and needs. For sea kayaking, this trip will best suit paddlers who have a fairly reliable roll, are comfortable with rescues and are keen to further build their confidence in more bouncy water. The exact location and plan for 2019 is yet to be confirmed and will build on the experiences of last year. The dates have been chosen to take best advantage of the tides and the warm, clear September water. Full coaching/guiding on the water. Transport of your kayak and equipment if required. You will also need to bring your own camping gear and we would recommend to bring food, aiming to top up whilst you are in France (we find the wine and bread particularly agreeable). If you are surf kayaking, bring a memory stick to keep all of the video footage that will be taken to help with your personal development and coaching. The cost for the trip coaching is £385pp. If you want to try your hand at both surf and sea, please give us some notice so that we can staff and equip it correctly. What is not included that I will need to budget for? Your ferry fee, sustenance, camping and adequate insurance. For the overnight ferry you will need to book a reclining seat or more. For the day time ferry you will not have to book a seat etc unless you choose to. We would recommend that you go in your own vehicle to allow yourself flexibility. If you wish to share one of our vehicles, or split the cost with another client please get in touch with us. Download a pdf with all this info here (this is for 2018 as we’re still finalising the details for 2019). We’re already excited and know that many who went last year are keen to come again. Get the dates in the diary and book now! This year will be the fourth year of Surf Kayak Symposiums – time flies…. In Oct 2018 we made the difficult decision to cancel the Autumn symposium; a tough decision but we’d rather people have a really good time than plod on with the event in poor sea conditions. 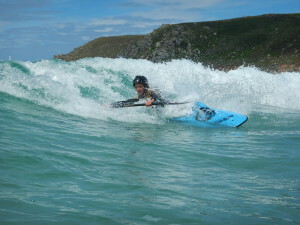 This year we hope for more amazing surf at the great locations that west Cornwall has to offer. Surf kayaking is becoming more popular again, and the symposium takes away the pressure of any competition, allowing all levels to comfortably enjoy it. It has been great to have a wide range of abilities and ages of both male and female kayakers over the years. Thanks to all our past participants (many of you are regulars now!) and all the coaches and assistant coaches that have worked with us over the years. We hope to see you all in 2019.